This DIY clipboard is so easy! 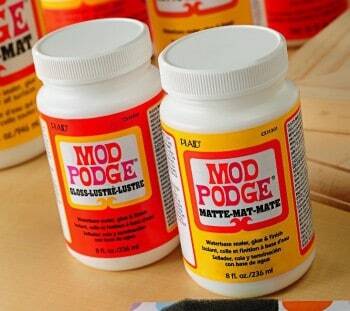 This tutorial will show you how it's done with Mod Podge – and it makes a great teacher's gift. Let's be honest – you could have a brown, boring clipboard – or you could have something quite a bit cooler. 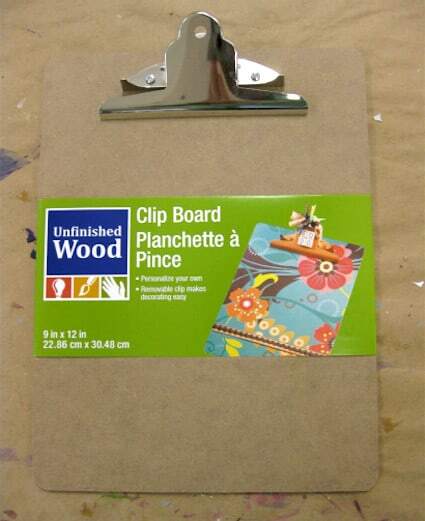 Basic brown doesn't work for me, so in this post I'll teach you how to make a DIY clipboard. I had a teacher in mind when I was making it: my mother! She was a fifth grade teacher for years . . . and wouldn't this make a great gift idea for a teacher? 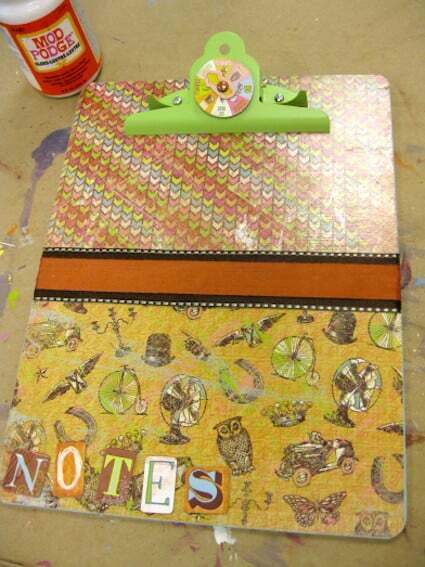 It's not hard to decoupage a clipboard, so if you are a beginning Mod Podger, you might want to take one on. Here's how I did it. Brown clipboard. Boring. I think I just fell asleep looking at it. Remove the hardware (it's easy, there are screws on the back) and spray paint it. This will give you a smooth coating on the metal. let it dry. 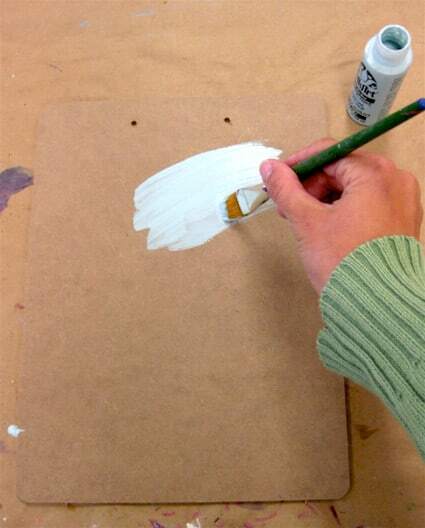 Paint the wood portion of the clipboard with acrylic paint. Give both sides of the board several coats and let dry. 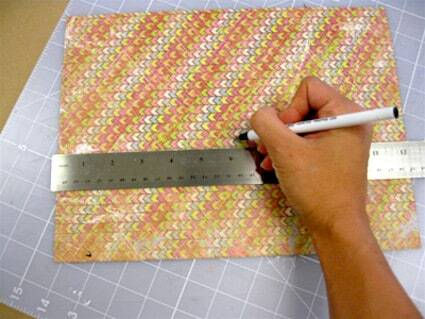 While the clipboard is drying, measure and cut the paper. I used two sheets with the intention of creating a seam in the middle. 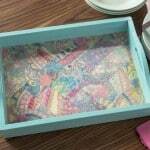 Add a medium layer of decoupage. Too much is better than not enough. 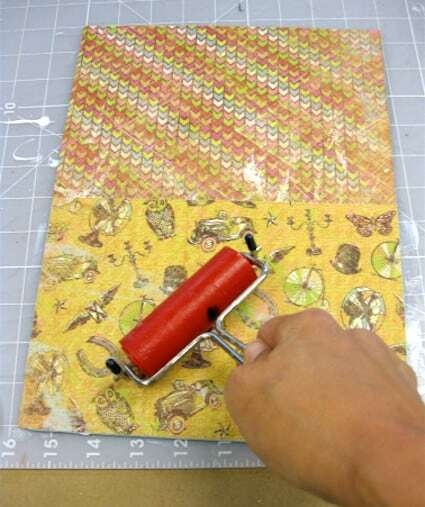 Use a brayer or your hands to completely smooth the paper down – wipe away any Mod Podge that squeezes out the side. 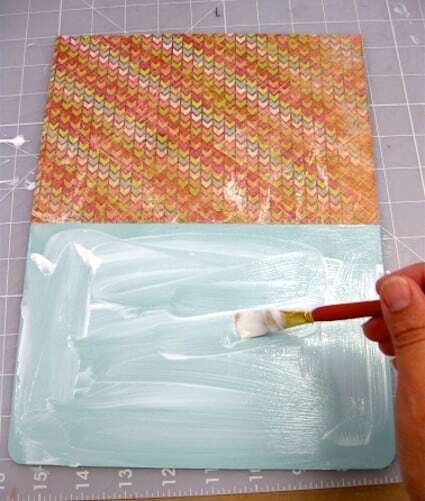 Let the paper dry for 15 minutes at the least, then coat the entire board with two coats of Mod Podge. 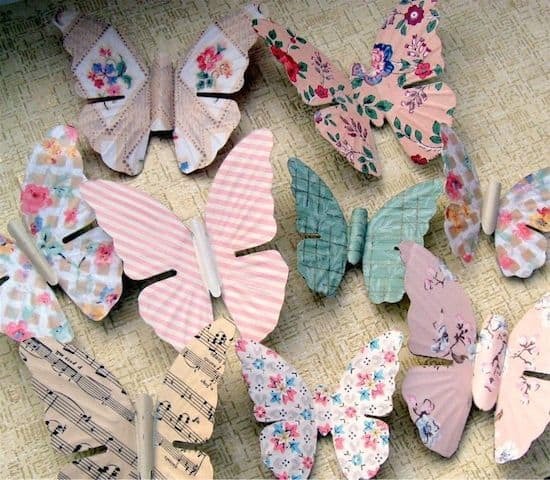 Re-attach the clip and add embellishments (such as letters and ribbon) with craft glue. Let everything dry. I tied ribbon to the top of my DIY clipboard – and that funny little sticker is a mood spinner. Hahaha! Fun, huh? I love that clipboard! 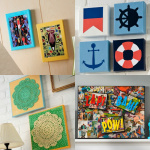 I remember decorating clipboards back in the day, of course it wasn’t with Mod Podge though 🙂 I love your awesome Mod Podge ideas! 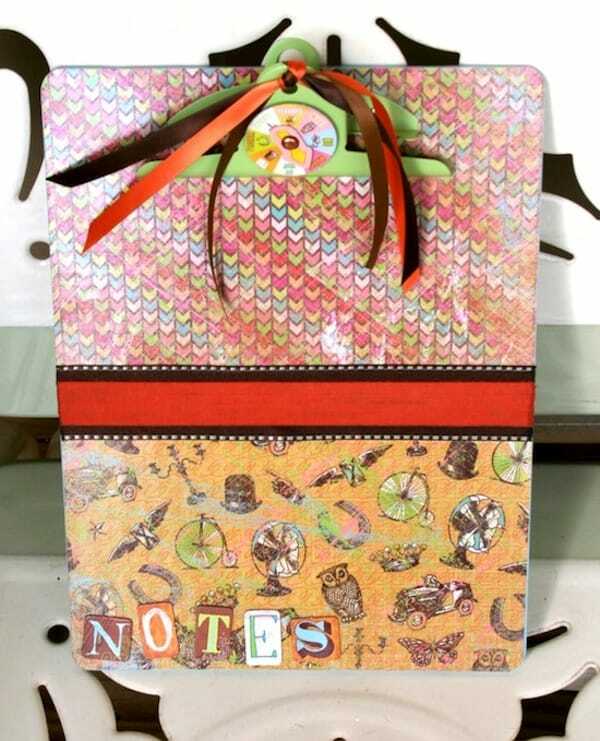 JoAnn – that’s a great idea to cover the back with papers too! I love it! I love this idea! I wanted to let you know that I featured this on my “What I Bookmarked This Week” post stop by and see. How fun Amy. The clipboard looks way better now. And you know I am up for spray painting anything and everything! Beautifully done! What a stylish upgrade. As a non-crafty person I, too, am wondering about removing the hardware. I’ve had my husband do that for me on several of my classroom clip boards so I could have a flat work surface, but he usually bangs them off and they are not in any condition to replace. What’s the easy method? Also, could you tell me the purpose of painting the entire surface with paint if you’re covering it with decorative paper? Hi Mrs. Yazzie – the ones I buy have clips with screws that you can easily remove with pliers. 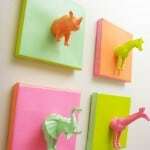 So I would get those from the craft store! Also, not all papers are thick, and some you would be able to see the brown of the clipboard through the paper. For thicker papers, you don’t need to, for thinner papers you should paint the entire thing. Hi Jackie! 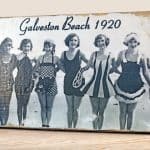 Got that from K&Company quite awhile back – I would take a look at the scrapbook section of your local craft store to find something similar! Where did you find the clipboards? I have looked everywhere and can’t find any with the clips that are removable? This one was from Michaels! I’d try there first. Amy, this is a GREAT tutorial!! Thank you for the step-by-step and pictures:) I had to share with my Etsy shop fanpage. I am the owner of Eljah*B and one Tuesdays, I share DIY tutorials. I posted yours this week. I hope you find more followers through the sharing. I just completed me first one and I have bubbles all in the paper; however the paper was completely flat before the Mod Podge . Help! Please! Hello! I recommend watching my videos at youtube.com/modpodgerocks – I think some of the tips there will help you! The best paper to use is cardstock. When you use regular paper (like typing paper thin), YES, it does bubble up alot. In my area, I haven’t found much patterned paper that is cardstock quality. It is mostly paper thin. 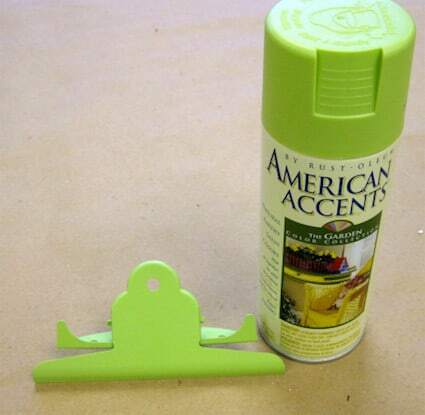 Then you wouldn’t get any bubbles using the modge podge. Hey, how did you remove the “hardware” off of it? I am having trouble with that! HELP! Hi Shanna! Mine had screws with nuts on the back that I could remove. My solution to the hardware problem is this: I don’t remove the hardware and just work around it covering it with paper the best I can. I always add a plethora of ribbon on top anyway so it covers any minor imperfections. While the Mod Podge is drying I hold the clip open with a zip tie(cable tie, that’s what I call them anyway). I didn’t paint my clip, but, if you wanted it painted, just paint it before covering the board in paper, I use scrapbooking paper btw. Hi – Attempting my first decorative clipboards. Love the look of the painted clips. How do you get the clip off, tho?